Many Android set-top boxes are based on application processors mainly targetting tablets such as Rockchip RK3188, and media capabilities including video quality, and audio pass-through are not always optimal, or not working at all. 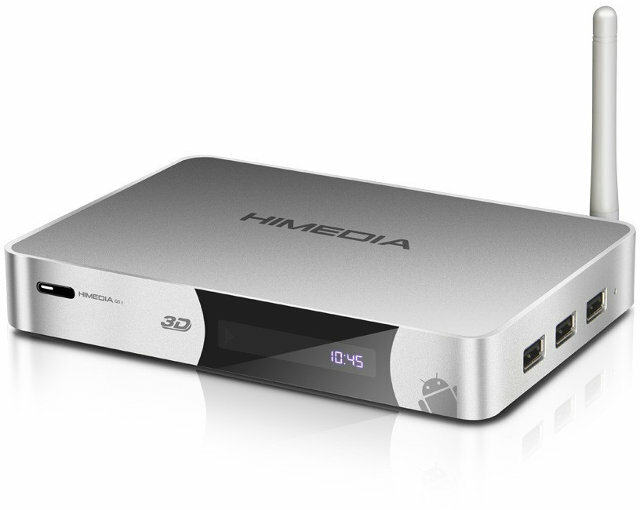 On the contrary, HiMedia Q5II, an Android 4.2 media player, is powered by HiSilicon 3718 (or is it Hislicon 3716C V200? ), a dual core Cortex A9 SoC designed specifically for media players. It also features an external SATA slot, HDMI and composite video output, optical and coaxial S/PDIF, and I’ve just found out the company worked on making video hardware decoding work with XBMC. SoC – HiSilicon Hi3716C V200 dual core ARM Cortex A9 @ 1.6GHz + ARM Mali-400MP4 GPU. N.B. : HiMedia indicates the processor is Hi3718, but most resellers give specifications with a dual core processor called 3716C… Hi3718 is not listed at all in HiSilicon website, and Hi3716C is a single core processor. So I’d guess it might be Hi3716C V200 which is a dual core Cortex A9 processor. lossless HD-Audio format, as well as DTS / Dolby Digital (5.1). The device come with a remote control, a power adapter, a SATA cable, an HDMI Cable, and a Quick Start Guide, which you can also download here. It shows how to connect the STB to your audio amplifier among other things. HiShare – Wirelessly shares media files (video/audio/photo) from your Android smartphone or tablet to your HDTV. HiControl – Transforms Android smartphone or tablet into a touchscreen and remote control. The video below filmed at the Hong Kong Electronic Fair by tablet republic shows XBMC with hardware video decoding running on the Q5 II. 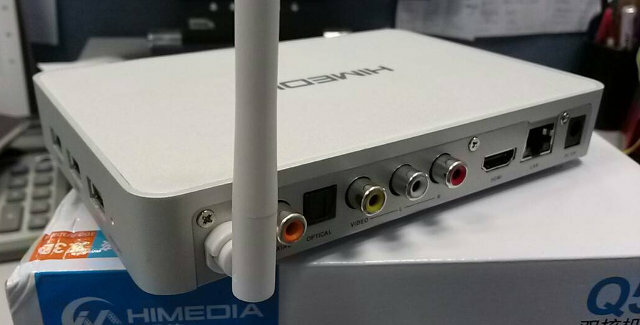 The latest firmware for HiMedia Q5II is available from their website, and dates from the 23rd of October, and it may or may not include XBMC hardware decoding capability. If the processor is indeed HiSilicon Hi3716C V200, it is supported by Linaro, or at least they work on it, so it might also be a fun platform to hack around, install Linux, or get the source code for the Android kernel. The box has been released in September, and can be found in Aliexpress or W2COMP for $129.99, and Amazon for $154.99. Despite the extra features such SATA, Aluminum casing, 3D Blu-ray decoding, etc…, the device seems a little pricey compared to other dual core Android STBs on the market. Further details ar available in Chinglish on HiMedia Q5 II page.